Description: Barry Harris (b. 1929) is one of the few living jazz legends: At the time of this writing he's 84 years old. When he was 66, he made a great album, Live At Dug, at the famous jazz coffee house in Tokyo, Japan. It was originally released by Enja Records of Germany. Now, released by the newly created Somethin' Cool label under the umbrella of Disc Union in Japan, this 2CD Complete Edition adds six previously unreleased tracks and presents the entire two sets of live music as it happened, in the order it happened. Sometimes referred to as a "preacher of bebop," Harris in this occasion was supported by to Japanese musicians: Kunimitsu Inaba on bass and Fumio Watanabe on drums. Harris delights the audience with his unmistakable bebop style and lyrical improvisation with a program of standards and bebop tunes written by Powell, Parker and Monk. 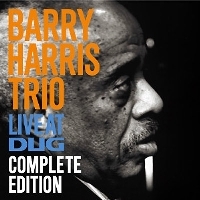 Recorded by Kimio Oikawa, a top Japanese engineer, the sound quality is very good, with the focus clearly placed on capturing the rich tone of Harris's piano. This is a great Japan-only reissue for fans of Barry Harris! Recorded live at Dug in Tokyo, Japan, on May 29, 1995. 2CD Complete Edition in gate-fold paper sleeve package. Released in Japan by Somethin' Cool in June 2014.